chai: v. (1) tear open; take apart. (2) pull down; dismantle. Over the past few weeks, some classmates and I have enjoyed lunch in the same Beijing alley almost everyday. It has been a true respite from the grimy existence found elsewhere in Beijing. This Haidian District alley is veiled in the shade of tall leafy trees. We were always the only foreigners in view, happy to pay the 4 RMB (U$ 0.50) for a bowl of spicy noodles. The 16 year-old server dropped out of school to work here for her aunt and uncle. She sends money back to her family in the countryside each chance she gets. China is home to about 70% of current construction sites in the world. 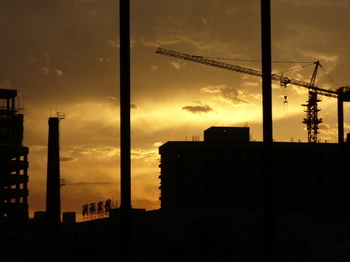 Life in Beijing (and elsewhere in China) occurs against the incessant backdrop of this construction. Dust allies with less benign particulates to blacken the inside of one's sinuses. From sunrise through sunset, the lullabies of cranes and sledgehammers wax and wane. In this ancient and crowded city, such a scale of development can only occur to the detriment of pre-existing structures and the individuals and communities that call them home. The Communist Party's rash employment of eminent domain, and its effect in disincentivizing productive use of land have long been a blemish on both the economy and human rights in the People's Republic of China. (See The Economist's survey of China from March 23, 2006.) This post only endeavors to encapsulate the injustice such a practice embodies. The proprietors received 48 hours notice that their livelihood would be taken out from under them. Not believing the Party would mobilize at such short notice, they were serving lunch when the demolition crew arrived. The crew gave them 30 minutes to remove everything of value from the restaurant. 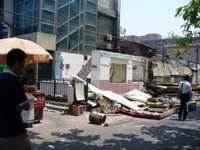 The proprietors told us that they are being given no compensation or relocation assistance. Professor Alfred Palaez, a Chinese law expert at Duquesne University School of Law, guesses that their next destination will be the suburbs of Beijing. The economic opportunities available there are certain to fall short of their formerly popular hang-out in the Haidian District. Every restaurant on the same block of "the alley" was in a similarly subjected to chai, (defined atop this post.) 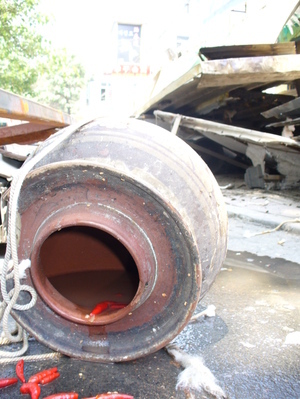 This is not at all uncommon in Beijing, ahead of 2008. Some of us just discovered another strip of restaurants in Haidian District, off of Xueyuan Lu, where locals congregated in the hundreds to watch the World Cup on about a dozen 19-inch televisions. 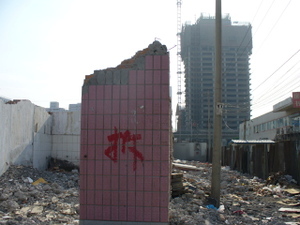 The character, chai, painted in red upon the stubborn wall atop this post. Chai also adorns the still-intact walls of those restaurants entertaining the local football/soccer fans, just down the street. This strip, too, is set for demolition by the end of June. Again, the locals assert that no compensation or relocation assistance is being extended by the Party. "If you want great riches, son, it's a merchant you should be. You can deal in goods from cars to cod, and earn more than enough. But don't buy or sell ‘cross borders, son, cause that's awfully risky stuff." We didn't have no C-I-S-G. If we bought or sold in another State we didn't know what the law would be. But now there's a Convention to make global trade more free. ‘Cept them gol-danged U.S. courts just treat it like the U-C-C.
Amnesty International is trying to raise awareness about cyber-censorship to make it a larger issue at the Internet Governance Forum (see here), a special UN conference that looks at the development of the Internet, which starts Monday in Athens. Google will also be present at the IGF, asserting that it is a proponent of free speech while debating intellectual property rights and how to connect Africa to the internet (see here). Google will declare itself unrepentant over the controversial decision to censor its search engine at the behest of Beijing, and it will insist that its presence in China does more good than harm by getting more information to more people. 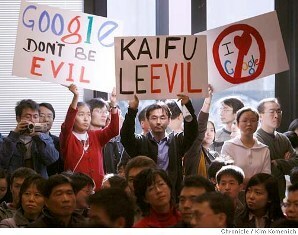 Amnesty International has firmly rejected this view of Google. Amnesty International has issued a 'Call to Bloggers', asking them to get online and stand up for freedom of expression on the internet. The organisation says this is a critical time when fundamental rights – particularly freedom of expression and privacy – are under threat from governments that want to control what their citizens say, and what information they can access. Google, Yahoo, and MSN all appease the censors in foreign countries (see here), and Yahoo has provided authorities with private and confidential information about its users that has been used to convict and imprison journalists (see here). Among those that have been arrested are Chinese journalist Shi Tao, Tunisian lawyer and human rights defender Mohammed Abbou, and Vietnamese political dissident Truong Quoc Huy. Most recently, student activist and blogger Kianoosh Sanjari was arrested on October 7th while reporting on clashes between security forces and supporters of Shi'a cleric Ayatollah Sayed Hossein Kazemeyni Boroujerdi. Kianoosh Sanjari is being held incommunicado at an unknown location and Amnesty International fears that he may be at risk of torture or ill-treatment (for more about Middle Eastern human rights see here). In the United States, we tend to take our problems straight to the top. It's easy to imagine a situation where the frustrated American issues the direction, "I want to speak to your supervisor." But when one sits across the table from the Chinese government, such a strategy may yield less certain results. The Chinese government is really nothing more than a structure imposed upon Chinese society to legitimize rule by the Community Party. Theoretically, it operates with the National People's Congress [NPC] wielding the bulk of the power. From this body the Standing Committee is selected, which runs the show when the NPC is not in session (i.e. most the time.) Together, these two bodies produce the Codes that compose Chinese law. Since China followed the Continental tradition, rather than the Common Law tradition, case law is less important for future litigants than are the Codes generated by the NPC and the Standing Committee. Under the previously mentioned faces of the legislative branch is the judiciary and the State Council, or executive branch. That annoying gap between theory and practice rears its ugly head regarding the executive branch. Theoretically, the executive branch is headed by the Premier (currently Wen Jiaboa,) while the President (currently Hu Jintao) holds a more ceremonial role. But here is an illustration of why squeeking to the apparent big cheese for grease may prove fruitless. China Law Blog recently did a post entitled “Protecting Your Intellectual Property in China—The Starbucks Perspective”. The post recounts advice Kim Teraberry, Director and Corporate Counsel at Starbucks, presented as part of a two day conference held by the US Patent and Trademark Office. The post opened with a piece of advice that can’t be said enough: register your trademarks early! Moreover, a company should not assume that their Roman script mark will protect them against a Chinese character version. Thus, a company should consider registering a translation and a transliteration of their company name. When choosing a Chinese mark, Teraberry said that a company should consider marketing objectives, multiple dialects, traditional and simplified characters, and trademark clearance. In a comment on the post, IP Dragon emphasized that there are a variety of dialects in China and a company that wants to take advantage of the Cantonese speaking market, which includes Hong Kong, should take into consideration the Cantonese pronunciation of their company and product as well as the Mandarin pronunciation. Furthermore, places such as Hong Kong use traditional characters; consequently, a company should also consider registering their trademarks in traditional characters as well as simplified. I enthusiastically join Harris’s opinion. Japan has put into motion a plan to put an unmanned probe on the surface of the moon within the next 10 years (see here). China is planning to launch a hundred earth orbiting satellites within the next five to eight years (see here), and also plans to initiate a multi-step program of robotic lunar space exploration (see here). Japan’s spaceflight program was known as the most ambitious in Asia until China put astronauts into orbit in 2005. Japan has yet to launch a manned flight of its own, but tentatively plans to land a man on the moon by 2025. China has yet to announce their plan to land a man on the moon but there is little doubt that China has such intentions. The USA and the EU plan to go to the moon in preparation for a mission to mars, and Japan’s lunar objectives are said to be in line with the USA and EU. Russia plans to land men on the moon by 2015, which will be funded by sources outside of the Russian space agency (see here). The USA does not plan to have a manned lunar landing until 2020. The exploration and use of outer space, including the moon and other celestial bodies, shall be carried out for the benefit and in the interest of all countries, irrespective of their degree of economic or scientific development, and shall be the province of all mankind. This is the very same rhetoric my career counselor at UC Hastings keeps telling me and my classmates. “If you start your career internationally without gaining foundational experience here in the US, your chances of coming home and practicing are limited if not impossible.” This may very well be true, but I think it primarily applies to people who want to make a lateral move from a big firm to another big firm. Everyone in law school assumes that everyone wants to land that big law firm job and make mountains of money. Since I was raised as an American, mammonism is a natural part of my psychological makeup, but I also have aspirations other than the desire to make money (yeah, I just said it!). 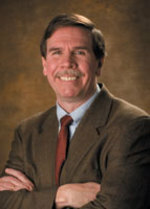 In his post, Agrasut said, “I often question many of the UK/US lawyers-in-training who intend to start their professional practice in China and for whom that goal is paramount, because I haven't yet heard a really good professional reason why they've chosen to set out their stand and declare for China so early in their career; I do, however, hear an awful lot of personal reasons.” Is there anything other than personal reasons?! What would a professional reason be?! Will someone please illuminate my dim, milk-like perception of the division between personal and professional reasons! The majority of the people I’ve met who want to start their law careers in China have developed a penchant for Mandarin and adventure prior to beginning law school. The best advice I can give to anyone that is considering a career abroad is to live there prior to making that decision. I spent the first three weeks of this summer in a study abroad program and a number of the students had never been to China and I doubt they will ever come back. I love China but in all honesty it is not a nice place to live. IT IS A DEVELOPING COUNTRY! Especially the urban areas! Beijing is dirty, polluted, loud, extremely hot and muggy during the summer and freezing during the winter, and the people are loud, rude, and dishonest. If I wanted to live in a nice place and work as an attorney, I would move to the Caribbean or Hawaii or I would stay right here in lovely San Francisco. For me, who had been given extraordinary linguistic talents, China was the locus of a range of fascinating sounds and expressive concepts, which nation, by extension, must also have been as exotic, mystical and enjoyable in every other aspect. That youthful idealism was highly imaginative, I found, upon arrival in a country where the traditional culture we had studied and venerated had been smashed; where ordained restrictions upon thought and behavior prevented the natural development of mind and spirit which thrives in liberty; where even the mere fulfillment of the bare necessities of daily life had become so onerous that one could hardly develop a life beyond it. Then why is Mr. Kuslan a “China guy”? I’m going to go out on a limb here and posit the notion that Mr. Kuslan is a “China guy” because he has a mild obsession with the language. I’m not saying that everyone living and working in China or abroad has an obsession with learning languages. I have also met the truly inexplicable person who desires to live and work in China but has no knowledge of the language and no desire whatsoever to learn it. Honestly, I think without knowing the language their career options are rather limited (and so are their dining options), but they do exist and some of them have very lucrative careers. In the end, who can explain why people are rushing to work abroad. Kuslan said, “This grossly expanding phenomenon is indicative of serious changes in the American mindset, as if Americans can no longer envision a future at home.” As I lightly stated in my previous post “The Future of Law is International” today’s law students cannot afford to turn a blind-eye to the rest of the world and it has as much to do with making money and surviving as it does with stepping through the looking glass, personal satisfaction, and introspective illumination. You have no idea who you are until you’re out of your comfort zone. As Hunter S. Thompson said, “You bought the ticket, take the ride.” Maybe the youth of America are looking beyond the borders simply because they can…? Thanks for your comments Travis. I do agree, but if I may clarify: my comments were directed very specifically at lawyers intending to practice at the cutting-edge of big-ticket transactional law, and yes, this will mainly take place at large international law firms. The essence of my personal view is merely this: if the country as a destination, regrdless of other factors, is one's aim, then obviously you should be there as soon as possible in your career. But don't expect that, with increasing globalisation, being a "China specialist" will always be as necessary a skill as it has been, and possibly is currently... market and commercial convergence may eventually mean that distinctions in business and commercial practices will become less important, and I think (just an opinion)that the company/bank/firm that operates in China will require and look to experts in, for example, derivatives, rather than someone who lacks such expertise but has studied Chinese politics and a little Sima Qian. Even the lawyers at my firm who are China specialists remain, above all, first-class lawyers who would be able to do what they do in almost any market in the world. Lawyers sell services--and services are increasingly sold across international borders. In fact, services generally are becoming the new game. In 2004, services, sold alone or as support features to the sale of good and products, accounted for over 65% of the gross domestic product (GDP) in the US, 50% of the United Kingdom's GDP and 90% of Hong Kong's. Our clients sell both goods and services. The growing "global economy", the expansion of the services sector, the Internet and the resulting ability to partner with people and entities all over the world permit our smallest clients to do business abroad. And lawyers in all jurisdictions can act for interests outside their borders. You, me, our clients and our partners are now international players. Every day we meet new ideas, new markets, new regulatory schemes, new traders and new customs. Our new world may not be exactly "flat" yet. But it's certainly become busier and smaller very quickly. 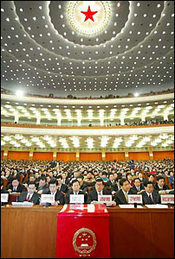 China Law Blog also recently made a post entitled, "China As Lawyers Paradise". This post pointed out that most people think there are too many lawyers in America, but the opinion in China is that there are not enough! The author, Dan Harris, contemplatively asked how many of the approximately 190,000 practicing attorneys in California are studying Mandarin? My response is that there are not enough, but any law student in the US that hopes to have a lucrative and enthralling career needs to have their eye on the international market.